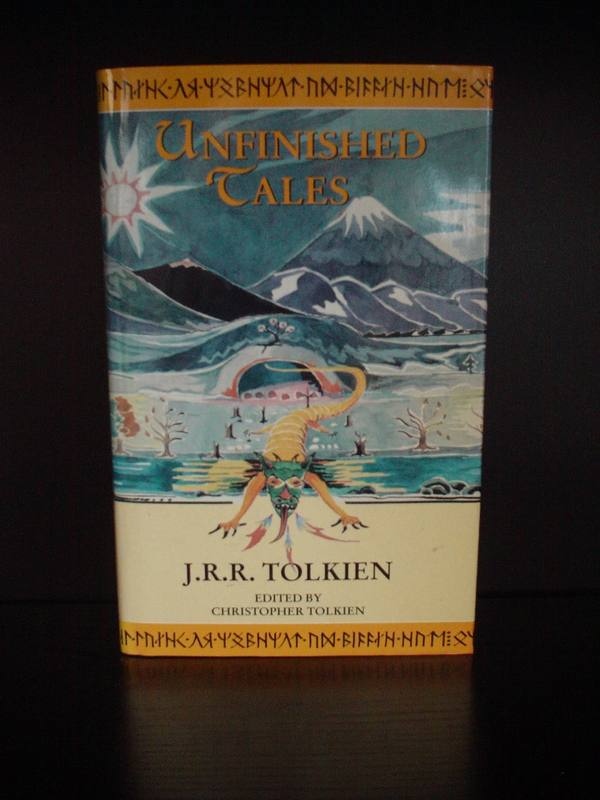 'Unfinished Tales', as the title aptly suggests, is a collection of Tolkien's 'expanded' Middle Earth stories (mostly longer versions of tales from The Silmarillion, but there are plenty of revealing Lord of the Rings moments featuring old faves Gandalf, Elrond, The Nazgul, Balrogs et al) edited into a single volume by the authors son, Christopher Tolkien. Unlike 'The Silmarillion' (which is universally recognised as a vital part of Tolkien's literary masterwork, but takes some effort to wade through the complexities of names, places, ages and references included in the earlier volume), 'Unfinished Tales' is suprisingly straightforward, by comparison; The style of writing is, for the most part, comparable to the tone of Lord of the Rings, including many (not to be missed) moments of classic Tolkien humour, some bitter-sweet obervations on the human condition with regard to affairs of the heart and the spirit, and last but not least - lashings of swashbuckling adventure. There is of course plenty of background detail and Tolkiens trademark descriptive passages read wonderfully well. Originally published by George Allen & Unwin on 2 October 1980 (number of copies not known, but the first three impressions together equalled 44.000 copies at £7.50) and by Houghton Mifflin on 18 November 1980 (80.000 copies at $15.00), also published by the Book-of-the-month Club. In June 1981 there was a reset book club edition, by the Science Fiction Book Club (number of copies unknown at $6.50). The first paperback edition appeared already one year later on 13 september 1982 by Unicorn / Unwin Paperbacks (15.000 copies at £2.95). 17 Days later there came an American trade paperback edition by Houghton Mifflin (30.000 copies at $8.25). Ballantine Books also made an edition on September 1988 at $5.95. Since then there were many editions. J.R.R. Tolkien's tales of Middle-Earth weren't restricted just to fantasy epic "Lord of the Rings." His life's work was spread over hundreds of stories and invented legends - some were compiled into "The Silmarillion." But some were left over - yes, there were even more stories that didn't make the cut. These little odd bits make up "Unfinished Tales of Numenor and Middle-Earth." The stories are not as interconnected as the Silmarillion was, but they are a solid and enjoyable read. 1. "The Silmarillion" is known to be a more difficult book- its presentational style renders it inaccessible to a lot of people. But if you manage to finish it you can reward yourself with Unfinished Tales, which deepens your enjoyment of "the Silmarillion" by providing more detailed (more gripping, more compulsively re-readable!) accounts of the same events, even though they are fragmentary and at-variance-with-other-writings. The first section of the book begins with the expanded account of Tuor's early life and his mission to Gondolin which, for some, is the greatest of all Tolkien's obscure writings. But the piece that follows it, "Narn i hin Hurin" (tale of the children of Hurin), is certainly another candidate for the title - an extensive recounting of the disaster-ridden lives of Turin and Nienor. Even with a large section of the story (including the whole of Turin's sojourn in Nargothrond) missing, it winds up being the most emotionally draining thing Tolkien ever wrote. The third section gives a more detailed background to the events at the end of the Third Age (i.e The Lord Of The Rings). There are accounts of "The Disaster of the Gladden Fields" and of the past tribulations of Rohan, and its special relationship with Gondor. There is Gandalf's perspective on the background to "The Quest of Erebor" (i.e The Hobbit), and, perhaps of most interest, Saruman's "Hunt for the Ring", or how lucky Frodo and Sam were even to get out of Hobbiton and begin their quest. The fourth section contains almost all the existing data on the origin of the Palantiri, the histories of the Druedain (aka the woses) and the Istari (aka the wizards). 2. Most of these posthumously published "archaelogical" volumes contain at least one "revelation" - a complete one-off in amongst all the spot-the-difference first and second drafts. And in this instance it's the the tale of "Aldarion and Erendis". It interrupts a capsule history of Numenor (a description of the island and a brief history of its ruling dynasty), shifting the focus from affairs of state to affairs of the heart, specifically the doomed romance between the sixth king of Numenor and a woman from the lower classes (so to speak: her shorter life-expectancy becomes an issue here). Where to begin describing this great tale? Well, if I may step out of character and oversimplify, Aldarion and Erendis began like Tristan and Isolde and ended like Charles and Diana. Which means two things become apparent here: Tolkien's flair for romance and his deficient social politics. In the end, whether Tolkien intended this or not, it works as a parable against arranged marriages. Summary: "Unfinished Tales" is a fill-in-the-gaps sort of book, and Tolkien's storytelling genius still shines through in this disjointed collection of essays, bits and pieces. For those hungering for more Middle-Earth. Unfinished, but definitely not Unnecessary.